Instead of returning 10, which is the total, the cell will return 4 – i.e. because there are 4 values given in the arguments. 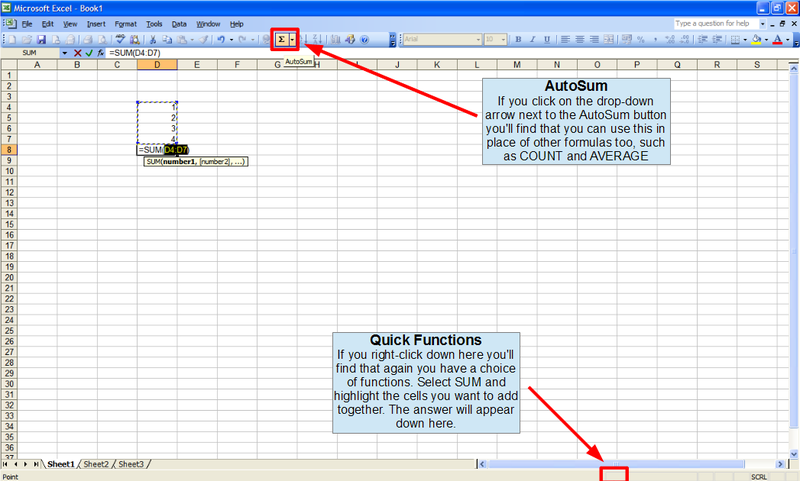 TIP: I rarely find it necessary to use this Function in an Excel formula - It’s much quicker to use Quick Functions. AutoSum will be set to use the SUM function by default, but it’s easy to change. Click on the drop-down arrow next to the AutoSum button and select the function you want to use. Now just select a cell and click on the AutoSum button. Excel will try to work out which cells you want to include in the formula – In the example above I selected a cell immediately below a column of numbers and Excel worked out that I wanted to count them. If the wrong cells are automatically included you can manually select cells instead. If you’re still struggling with the COUNT Function you might find it helpful to have another look at the Getting started with Excel formulas page.